Elizabeth Hutchinson was born circa 1740 in Carrickfergus, County Antrim, Ireland. She was the daughter of Francis Cyrus Hobart Hutchinson and Margret Lisle of Royston. Andrew Jackson, Sr. was born about 1730 in northern Ireland. Elizabeth and Andrew were married in Carrickfergus circa 1761, and the couple emigrated to America in 1765 with their two young sons, Hugh and Robert. They were Presbyterians escaping religious persecution and tariffs from the ruling Anglican faction. Four of Elizabeth Jackson’s sisters and three Crawford brothers – James, Robert and Joseph – also moved with their families to America at that time. James Crawford was married to Jane Hutchinson, Elizabeth’s sister. 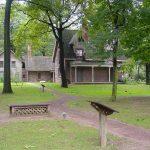 Within a short time of their arrival, the Jacksons acquired 200 acres of poor land at Twelve Mile Creek, a tributary of the Catawba River in the Waxhaws settlement in the Carolinas, southeast of the present city of Charlotte. There the Jacksons began their life in America. 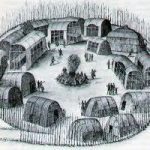 Waxhaws is the name of both an extinct American Indian tribe and of a geographical area bordering North and South Carolina. At that time, the Waxhaws consisted of little more than a Presbyterian church, a general store, and a few scattered houses. In February 1767, the elder Andrew Jackson died unexpectedly at the age of twenty-nine – just before his wife was to give birth again. Andrew Jackson II was born March 15, 1767, just three weeks after his father’s death. 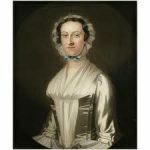 A few weeks later, Elizabeth and her sons moved to the house of her sister and brother-in-law, Jane and James Crawford, just over the border in South Carolina. Jane’s health had greatly deteriorated after she moved to America, and she was now and invalid. Elizabeth raised Andrew for the first thirteen years of his life in the Crawford house, where she worked as a housekeeper and a nurse for her ailing sister. Growing up, Andrew would be a guest at the houses in which he lived, not a son, except of a loving mother who was never the mistress of her own household. The Crawfords were more affluent than the Jacksons. The loss of Mr. Jackson only widened the gulf. When the Revolutionary War broke out, Jackson and his brothers were anxious to fight the British. Elizabeth had regaled her sons with stories of the battle for freedom in her native Ireland, including tales of how their grandfather had fought against the British in Ireland and participated in the siege of Carrickfergus. It was several years, however, before the war for independence reached the Southern colonies. In 1780, the British launched an invasion of South Carolina and captured Charleston on May 12. Groups of soldiers and Tory sympathizers began to loot and pillage the countryside. Three hundred soldiers leveled much of the Waxhaws settlement, surprising a force of several hundred American patriots and killing more than a hundred of them. The massacre sparked widespread outrage, as many bodies were mutilated and some had suffered more than a dozen wounds. The approximately 150 wounded were put up in the Waxhaw church, where residents, including the Jackson family, tended to the wounds and administered first aid. After the Waxhaw massacre, Andrew (age 13) and his brothers Hugh and Robert joined a patriot regiment. Soon thereafter, Hugh died from heat exhaustion at the Battle of Stono Ferry. 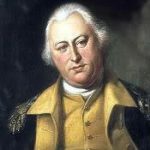 In the late summer of 1780, British commander General Charles Cornwallis gained an upper hand following the battle of Camden, which left the patriots in tatters. As Cornwallis marched toward the Waxhaws, a yearlong battle of attrition began. After a small engagement near Waxhaw, Andrew and his brother Robert hid in the house of their relative, Thomas Crawford. British dragoons discovered the two and began to destroy the house, tearing apart furniture and breaking windows. The prisoners cowered in the living room until the British commander ordered Andrew to clean the mud from the soldiers’ boots. Andrew refused, replying, “Sir, I am a prisoner of war and claim to be treated as such.” In an angry response, the soldier raised his sword and swung at the boy’s head. Jackson managed to deflect part of the blow with his left hand, but he received a serious gash on his hand and another on his head – two scars Andrew would bear for the rest of his life. When Robert also refused to clean the boots, he was sent staggering across the room by a blow from the officer’s sword. As a result of this incident, Andrew and Robert were held prisoner at Camden, South Carolina. Both boys became infected with smallpox and would have likely died, but Elizabeth arranged a prisoner transfer – the patriots turned over thirteen redcoats and the British freed seven prisoners, including the two Jacksons. Andrew walked 40 miles back to Waxhaw, while his mother and his dying brother rode beside him. Robert died two days after returning home, and it was several weeks before Andrew regained enough strength to leave his bed. Andrew, if I should not see you again, I wish you to remember and treasure up some things I have already said to you. In this world you will have to make your own way. To do that you must have friends. You can make friends by being honest and you can keep them by being steadfast. You must keep in mind that friends worth having will, in the long run, expect as much from you as they give to you. To forget an obligation or be ungrateful for a kindness is a base crime, not merely a fault or a sin, but an actual crime. Men guilty of it sooner or later must suffer the penalty. In personal conduct be always polite but never obsequious. None will respect you more than you respect yourself. Avoid quarrels as long as you can without yielding to imposition. But sustain your manhood always. Never bring a suit in law for assault and battery or for defamation. The law affords no remedy for such outrages that can satisfy the feelings of a true man. Never wound the feelings of others. Never brook wanton outrage upon your own feelings. If you ever have to vindicate your feelings or defend your honor, do it calmly. If angry at first, wait till your wrath cools before you proceed. After Andrew got well, Elizabeth left to tend to other soldiers, who were being held on prison ships in Charleston harbor. The work was hard, and she took ill with ship’s fever – cholera. Elizabeth Hutchinson Jackson died November 1781 at Charleston, South Carolina. As a notice of her death, relatives sent a small pile of her belongings to Andrew, whose entire immediate family had died from war-related hardships, which he blamed on the British. Orphaned at age fourteen, Andrew had only distant maternal relatives to supervise his continuing education, which he resumed after a brief residence in Charleston. In his late teens, Andrew read law, was admitted to the bar in 1787, and became an outstanding young lawyer in Tennessee. I knew she died near Charleston, having visited that City with several matrons to afford relief to our prisoners with the British – not her son as you suppose, for at that time my two Elder brothers were no more; but two of her Nephews, William and Joseph Crawford, Sons of James Crawford, then deceased. I well recollect one of the matrons that went with her was Mrs. Barton. If possible, Mrs. Barton can inform me where she was buried that I can find her grave. This to me would be great satisfaction, that I might collect her bones and inter them with that of my father and brothers. Andrew Jackson’s father and brothers were buried in the Old Waxhaw Presbyterian Church cemetery in upper Lancaster district, near Jackson’s birthplace. 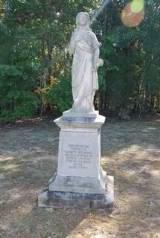 Agnes Barton was located and interviewed on the subject of Elizabeth Jackson’s burial place. She had come to the Waxhaws when Andy Jackson was two years old, but during the Revolutionary War, she and her husband went to Charleston and settled in the suburbs of that city. 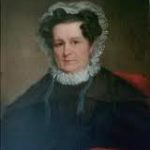 When Elizabeth Jackson became ill, she was taken into Mrs. Barton’s home and nursed. When she died, Mrs. Barton dressed the corpse in her own best dress, while Mr. Barton built the casket. They buried her on a hill in a simple unmarked grave. Andrew Jackson never fulfilled his wish to find the bones of his mother and place them beside his father’s and brothers’ graves. Not until 1949 was there a marker to Elizabeth Jackson placed in the Old Waxhaw Presbyterian Cemetery. 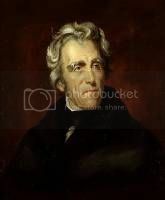 President Andrew Jackson, died June 8, 1845, at his home, The Hermitage, in Davidson County, Tennessee.